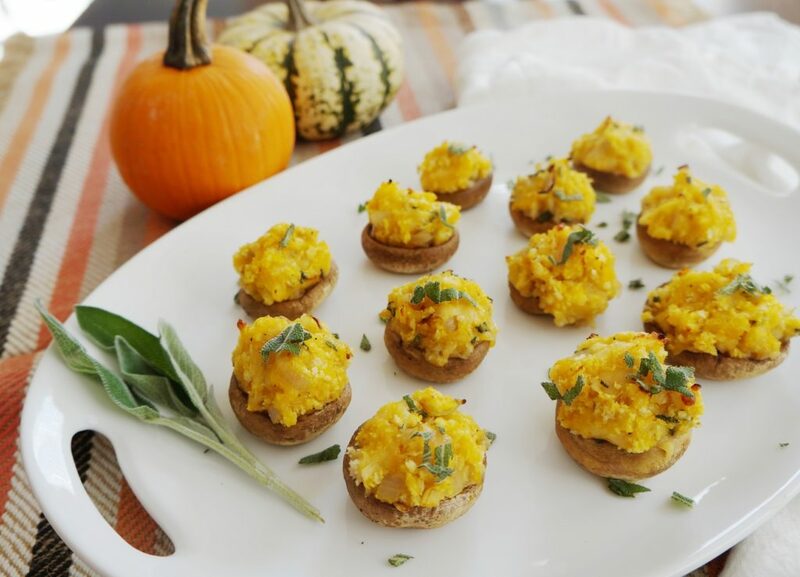 I woke up this morning and on a whim decided that I want to make an appetizer for Thanksgiving tomorrow. We are headed to my mom and dad’s house, so she is doing the vast majority of the cooking. I am making a pumpkin coffee cake for dessert (not healthy at all, but SO good and always a big hit), but I was in the mood to make something savory, too. I was trying to think and new and festive appetizer ideas and I thought of an amazing cheesy butternut squash pasta sauce I made a few years back. Using those same basic flavors, I concocted a filling for stuffed mushrooms and let me just say- I am THRILLED with how they turned out. 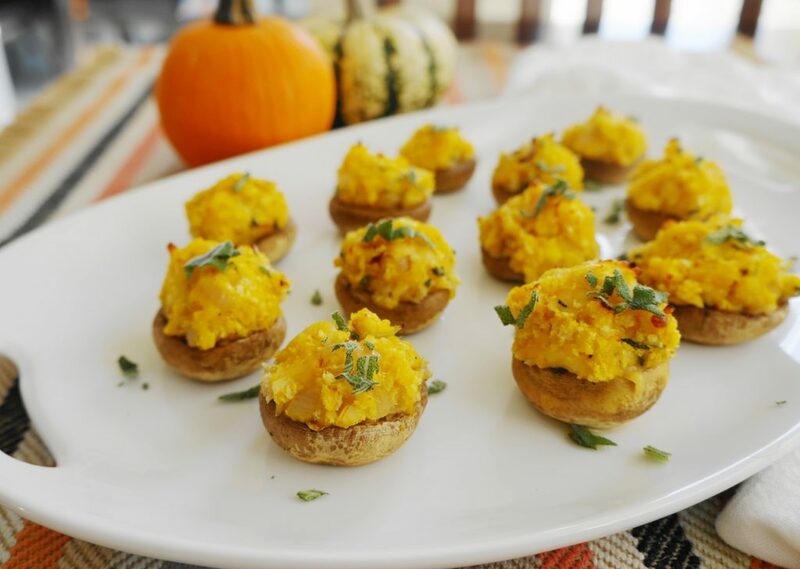 The whole recipe makes about 24-30 Cheesy Butternut Squash Stuffed Mushrooms, depending on the size mushroom you are using. They take a little while to cook from start to finish, but you could absolutely make the filling ahead of time or the night before to save time. I ended up stuffing just twelve mushrooms today for the trial run and photos, and put the rest of the filling in the fridge to use tomorrow when stuffing the rest of the mushrooms for Thanksgiving. I also bought butternut squash already peeled and cubed in small pieces, so all I did to roast them was toss them onto a baking sheet. I would definitely recommend buying the squash this way because butternut squash is definitely not easy to cut up and would take you much longer. 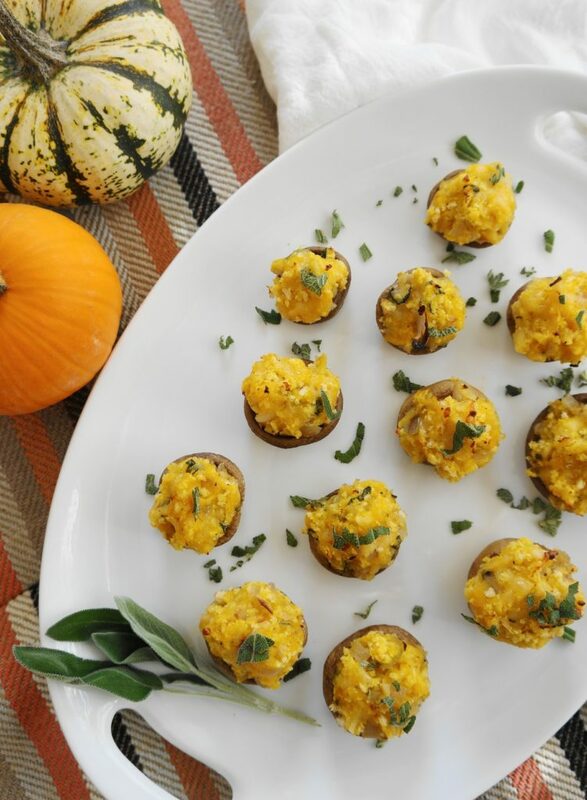 These Cheesy Butternut Squash Stuffed Mushrooms are full of flavor from the fresh sage, sweet butternut squash, and savory parmesan cheese. Once you eat one, you will definitely be going back for a second and third! 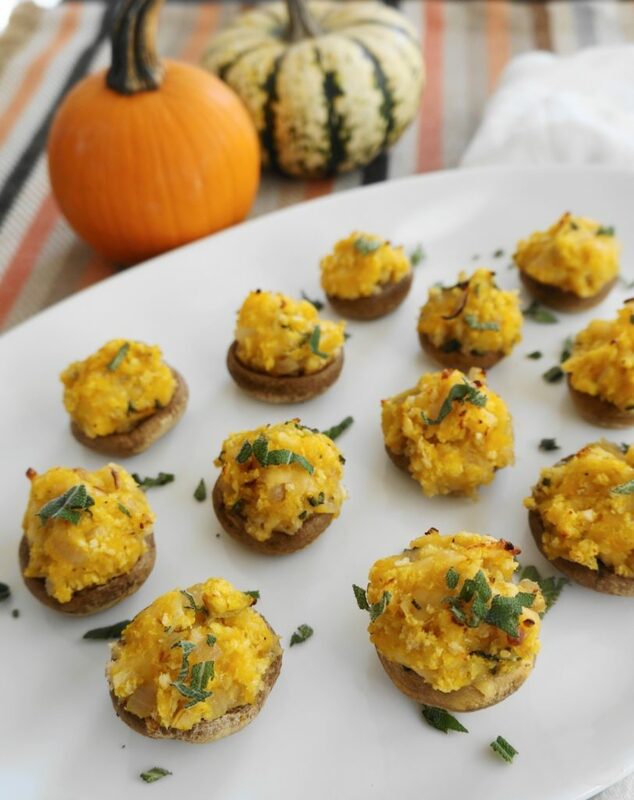 If you make these Cheesy Butternut Squash Stuffed Mushrooms, let me know by leaving a comment below! As always, follow me on Instagram for more recipe inspiration! Preheat oven to 450 degrees F. Line a baking sheet with foil. Place butternut squash cubes on foil-lined baking sheet, drizzle with 1 teaspoon extra virgin olive oil and sprinkle with salt and pepper. Bake for 25-30 minutes (or until soft), flipping squash half way through. Meanwhile, wash or wipe clean all of the mushrooms. Remove and discard stems. Set aside. Finely chop the shallot and mince the garlic. Saute in a small pan with 1 teaspoon olive oil until softened and fragrant. Transfer to a large mixing bowl. During the last ten minutes the squash is roasting, place the mushroom caps on a baking sheet and bake along with the squash (this will let the mushrooms release a lot of their water). Remove everything from the oven and turn the temperate down to 400 degrees F.
To the large mixing bowl with the shallot/garlic, add the butternut squash and sage. Lightly mash the squash with a spoon until creamy. Add the Parmesan and Panko breadcrumbs. Drain the water off of the mushroom caps, then stuff with heaping spoonfuls of the filling. Transfer the filled mushroom caps back to the oven and bake for an additional 10 minutes. Serve immediately.